Greetings from ANGA COM 2015, the leading cable show for broadband operators and content providers in Europe! – We have moved – Follow us on www.telestehub.com! This year, ANGA COM gathered together around 450 companies from 35 countries covering such key topics of the industry as TV everywhere, video-on-demand, multiscreen, cloud TV, all-over-IP, broadband expansion, FTTH, DOCSIS 3.1, Ultra HD, DVB-T2, connected home, RDK, Wi-Fi, CCAP, net neutrality, media policy, antitrust law and digitalization. 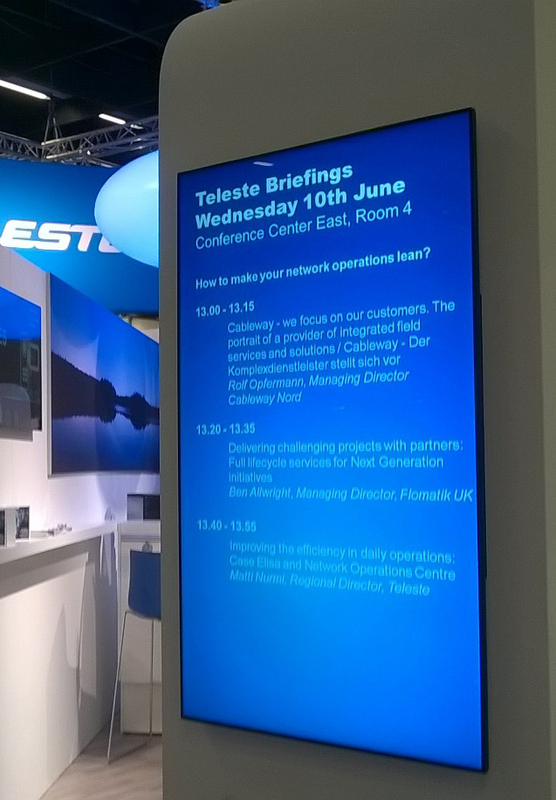 Teleste has been a frequent exhibitor at ANGA for a number of years. This time we marched in proudly rolling out Gigasphere with our full range of DOCSIS 3.1-compliant network products. In addition we showcased solutions for intelligent network management, and presented our view on distributed access and new home related services under title “Intelligent home toolbox”. Traditionally we have limited our presence to stand activities and congress presentations but now we jumped in with a new approach: In order to share our insights and involve our customers in a dialogue on their pain points and future challenges, we came up with an idea to organize a series of “mini-summit briefings” in conjunction with the show. Brilliant – Nothing beats real interaction with your customers! When moving on from the idea to the deployment we ran into questions such as how to attract your audience to take part in your event? What is the best way to reach the audience? The type of shows like ANGA offers all kinds of events during the day, with even a congress running aside. The competition for the audience’s time is tight. Sending a couple of plain email blasts out to your target groups prior to the event is not enough, so what is it that we need? We did send several emailer invitations to the target groups (did search out our customer database to identify contacts that would be interested in certain themes). Additionally, we aimed at creating visibility by publishing several press releases prior to the event and by advertising through internet and social media. Planning and more planning is needed – you need a content strategy to drive the themes, you need to be on the move early enough to get noticed. Content is surely the king, but how do you succeed to spread the word around? Ad hoc campaign does not do the trick; instead you need redeem your share of customers’ mindset by providing relevant allocated content through various channels constantly, and by letting your customer to decide when and where they wish to pick your message up. This way your event is likely to get noticed more easily. When you decide to organize an event aside an exhibition, make sure you are easy to reach, carefully choose the time and place, give the customers a possibility to sneak in discretely. Align marketing and sales: start talking about the event early enough, involve your sales to ponder about how to identify and reach the right contacts and eventually to speak for the event! Understanding customers’ pain points and challenges is vital – we need to be close to our customers to be able to meet the expectations and to provide quality experiences. Engaging many parties to the discussion is a good way to commonly share best practices and increase our insight on customer needs. This year’s major cable show is done, now we just keep gathering ingredients for the next recipe: IBC2015, here we come!